The largest truck in the AEC range was the Mammoth Major model. After the modernization in 1934 a model 680 (Mammoth Major 8) was produced only one year. Then, from 1935 to 1948 models 386 and O386 were produced. As for three-axle truck Mammoth Major 6 (model O366) of the second generation, it was produced since 1935 to 1948 also. Payload of the heaviest four-axle model was 15 tons. These trucks were equipped with 4 or 6-cylinder gasoline engines (5123 or 7413 cm3, 80-92 hp), single plate dry clutch, 4-speed gearbox, spring suspensions, hydraulic brake with vacuum booster and very durable welded frame. 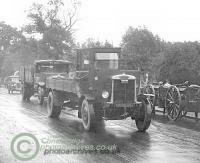 In 1948 the trucks were replaced by the third generation MkIII.